Chester County immigration lawyer Theodore “Ted” J. Murphy was awarded a 2018 PBA Special Achievement Award for his work as co-chair of the Immigration Law Committee, specifically for his efforts to establish a certification in immigration law to help improve the profession. PBA Special Achievement Awards recognize those lawyers and individuals who have provided time and resources to improve the association and the legal profession. 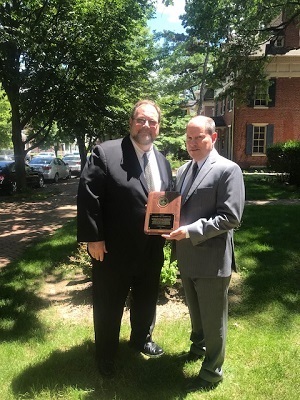 Pictured below are Murphy (on right) and PBA Pro Bono Coordinator David Trevaskis who thanked Murphy on behalf of PBA President Charles Eppolito III and the members of the association.